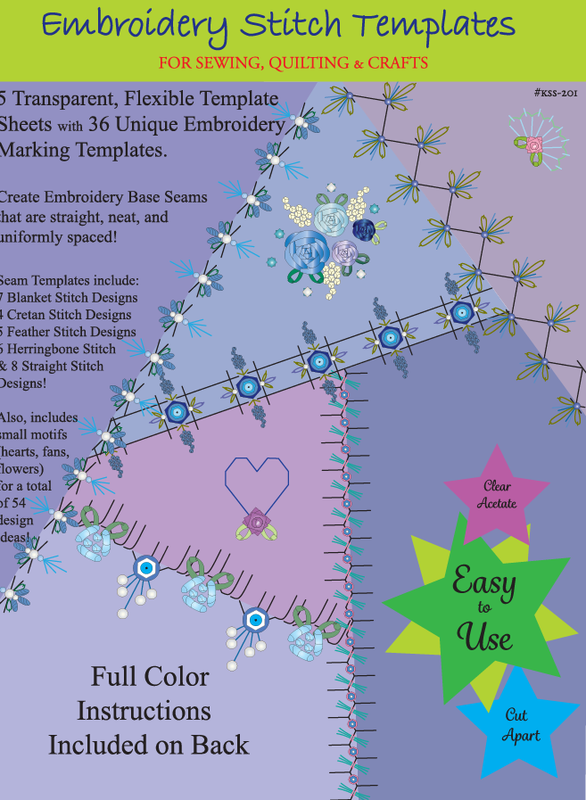 I've been very busy of late...and am working on a Shibori butterfly pattern example for the LAST PAGE of Crazy Quilting Volume 2: Ribbon Embellishments. 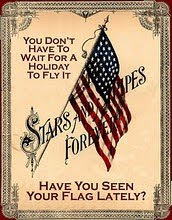 So, am now almost ready to send the book to the editor (that wonderful Ms. Mary Richardson) for a final review. Woot! Woot! Will be ordering the Proof Print in a couple of days...to review the artwork quality. Then..final changes...and off to the printer! So...Counting in days now instead of weeks to have this next book on the streets for you! (I know I've been slow...but really, you'll understand when you see it...packed full of new patterns and instructions). Also, got this beautiful half-doll in the mail today...so will be working on a pincushion...which I've been wanting to do for a while. (Inspired so much by Maureen Greeson's wonderful photos of her collection...thanks for the push to get one for myself!). Also, wanted to show off my baby sister's engraving skills...do you recognize the design on my (knock-off Yeti) cup? It is my Shawkl Designs Logo! Clever sis! 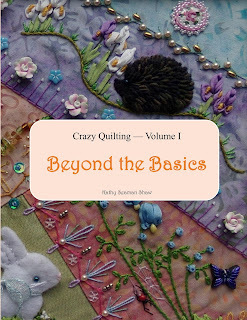 Lastly, while I do not have any of the Crazy Quilting Volume I: Beyond the Basics books in my Etsy Shop at the moment...you can get them on Amazon.com...internationally too. 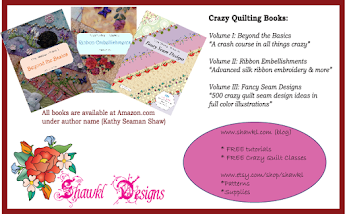 You may need to search for my author name to find it...try Kathy Seaman Shaw. 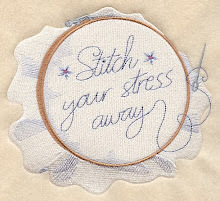 Also, Amazon has Embellishing Crazy Quilts, the workbook of seams/motifs. These are also in stock at my Etsy Shop. So, if you've been wanting any of these...it's a good time to get them before the next book hits the street...so you can have them all. Hugs! Awesome to hear...good for you!! Your butterfly is simply gorgeous, as is everything I've ever seen you do. You've gone from the start of TSiTM, when I first found your blog, to publishing your third book! And I see a lot of your influence on the internet blogs where I check on CQ photos. =) Congratulations! That butterfly looks fantastic already and it isn't even finished. Glad to hear about the 2nd book. Your butterfly is stunning! Can't wait to see the new book! Thank you for the kind words Kathy! 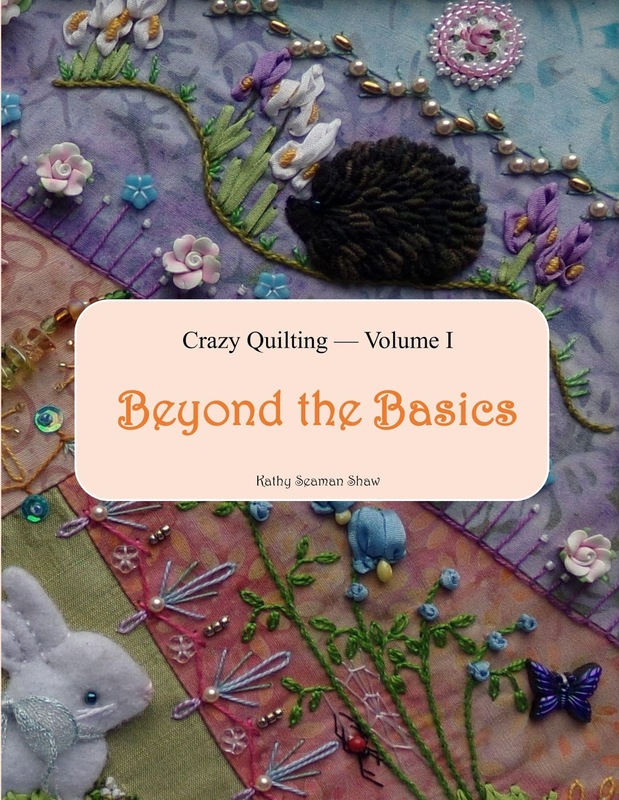 I love proofreading books about crazy quilting so it's definitely not a hardship on my part. I'll edit quickly so the book can get out to the waiting public!! Gorgeous work ~ you inspire me :) Congratulations on another book finish!